The Rebel Sweetheart. 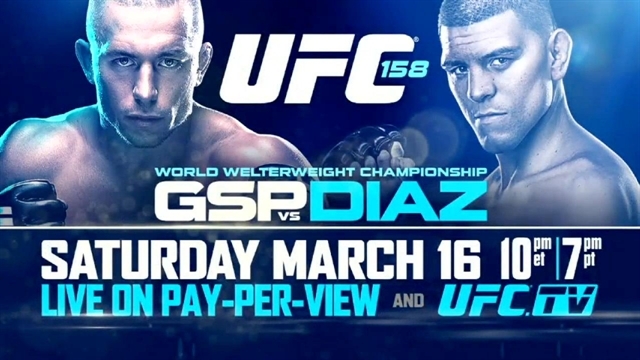 : Counting down to UFC 158! Do I even have to say it? I'm all for Georges St. Pierre of course! Canadian mixed martial artist and current Welterweight Champion (the title which he defended seven times, by the way), GSP is pretty much the one that got me hooked to UFC, mixed martial arts, and Brazilian Jiu Jitsu. Sure, my husband has been into MMA and the UFC even while we were still dating, but back then, I just watched matches in passing. Meaning, I wasn't really interested. It wasn't until GSP's fight against Josh Koscheck in UFC 74 some six years ago that made me pay close attention to the Rush, and the league in general. Fast forward to this year, UFC 158, where the champion will be defending his title Nick Diaz - a BJJ black belter, former Strikeforce champion, and one of the meanest personalities in UFC today. He talks a lot, talks trash, and oh, did I mention that this is his comeback fight after being suspended for a year for failing a drug test and popping positive to marijuana? I'm not putting Diaz in bad light by saying these things, but it is what it is. Est quod est. 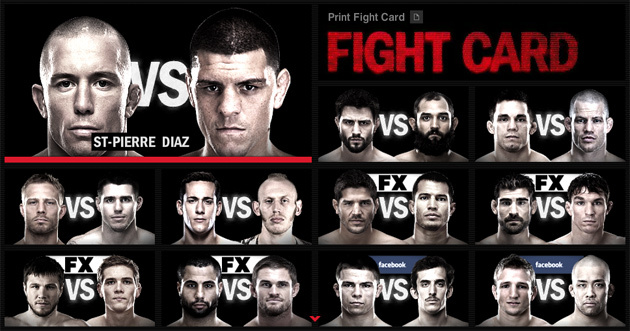 Anyhow, here's the fight card for tomorrow, and my picks on some of the matches. -Carlos Condit (169) vs. Johny Hendricks (171) - Hendricks! If not for this long overdue fight against Diaz, GSP would be defending his title against Hendricks - the number one contender at this time. -Mike Ricci (156) vs. Colin Fletcher (155) - Ricci! I was hoping he'd be the victor in his season of The Ultimate Fighter, but he eventually lost to Colton Smith. I'm freaking glad he's in the Montreal fight card, even if he's battling against the scary-looking Freak Show. UFC President Dana White had to come in between at the weigh-in. I haven't seen very many UFC fights, but it is easy to see how simple it would be to get hooked on them. UFC has really emerged as a popular sport and just by watching a match, you'll be excited as anything can happen in the octagon. WOW that's a lot of testosterone! haha!..never seen this fight yet. But the way you're telling about it, this sounds interesting to me. Good luck to your bet GSP! You sound like me during football season! Good luck!! Its so funny to me that while I have no interest at all in UFC, both of my young adult sons think its the greatest thing ever to watch the fights! No idea how they got such a passion for it, but they sure do get excited!! !